Positive Changes Hypnosis: The Olmstead's Success Story! 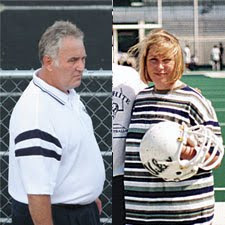 Our names are Scott and Lisa Olmstead, we live in Granville, Ohio, and together we lost 123 pounds, in 6 months with Positive Changes Hypnosis. We had wanted to lose weight for quite some time and even did research with the other major weight loss centers. We were always too into eating to do a real strict diet plan. We had tried here or there but nothing really stuck. Basically we hadn’t bottomed out to the point where we wanted to commit to something and really see it through. We would plan such big meals that when we ate spaghetti, you needed a fork lift to get it over the table. We used to eat until we were miserable, sick from eating too much. We really felt like we were too stupid to stop. But that feeling was coming to an end. Our daughter graduated from college in May of 2007. That was when Scott bottomed out. He had a suit on and just felt sloppy. He knew nobody was saying, “Who’s your Dad, is that fat guy over there?”, but he really felt like he looked embarrassing. There he was wearing a size 48 waist and unable to really enjoy his daughters achievement. We had a family friend who was a dedicated chain smoker; he literally lit one cigarette off of the other. One day while at a get together for golf he bragged that he had smoked his last cigarette. We looked at each other and asked, “Is that under 45 minutes or over?” He went on to tell us he was hypnotized. It seemed like an incredible story at first, but we never saw him smoke another cigarette. Now 28 years later while hinting around that we needed to lose weight we came across an ad for Positive Changes Hypnosis , so we visited the website and read lots of testimonials, but we were curious about how it could work for weight loss. We truly felt this might be perfect because it would fix what is in our heads, what needed fixed. Not what food we were eating, but why we were eating it. We knew it worked for quitting smoking and we felt we needed more information so we scheduled for the free consultation. Maybe this was the wrong time to start? Our son is a college football coach so we go to all the games and we had to go tailgating, of course that means; brownies, cookies, beer. At first we thought this might be the wrong time to start the program because of our planned activities. We were afraid it might sabotage our success. Thankfully, that was not the case. We continued to lose weight-an average of 7 pounds a week, and all we could think is, “If it is this easy now it is going to be super easy in the summer!” We were able to attend family functions and not feel deprived. We watched as a family member put himself on a strict diet. He even had to travel with his own food, and at that point we made a decision we would never do anything that made us stand out like that. We wanted something that would allow us to live life to its fullest, and hopefully things would take hold. That is exactly what is happening at Positive Changes Hypnosis. We were still living our lives, better than we ever dreamed possible. It is just so easy. There is absolutely no effort to this at all. When we first started we were laughing at how much weight we were losing. Scott was dropping 5-6-7 pounds a week. When Scott got down to a size 40 inch waist it changed his shopping experience, every pair he tried on fit as if they were tailor made for him. All he could think was “Holy cow, this is so easy.” The weight just kept coming off as he plunged from a 48 waist to a 36. Lisa results were just as stunning going from a size 18 to a slender 8, smaller than she was the day we got married! We wanted to tell our family about Positive Changes Hypnosis, but wanted to wait until we had real measurable results. They had been wondering what we were doing, and at one point thought we might be taking pills. We wanted to set their fears at ease. At Christmas Scott had lost 60 pounds and Lisa 18, we felt it was time to let them know. They were relieved since they knew we were losing the weight safely, and it felt good when our children told us how proud they were that we had finally found something that works. When we first started thinking about losing weight a friend of ours wanted to join at that same time, but she was skeptical and told us to go and try it first. That is exactly what we did. A few months later, while she was visiting, and we had lost a noticeable amount of weight she abruptly got up to leave. We asked, “Was there something the matter?” we were afraid we had angered her in some way. She simply expressed her frustration at not joining with us all those months ago. Since we had an appointment coming up we offered to take her with us so she could see what it was all about. She wisely enrolled and has lost almost 30 pounds to date. About a third of the way through we started to get nervous about whether or not these great results would last. We soon realized we didn’t have to worry because the weight kept coming off and we reached our goal 5 weeks before the end of our program. We have truly made a permanent change. With the weight gone we are enjoying our date night more than we ever did. We are getting so comfortable in our new skin that we are looking into starting ball room dance classes. The name of the place is Positive Changes and that is exactly what we got. We are living life better and we are more positive about our future. We couldn’t list all the benefits we have now thanks to Positive Changes Hypnosis because there are just too numerous.